The Routt County Fair Association was incorporated on April 14, 1969 in order to conduct educational and recreational activities, which promote agricultural and livestock exhibits, horse and cattle shows, fairs, rodeos, races and related activities. It is an independent nonprofit 501(C)(3) and the fairgrounds have been designated a Routt county Historic Site. The Board of Directors consists of nine members from North, South, and West Routt as well as At Large positions, appointed to three-year terms by the Routt county Board of County Commissioners. The county owns the grounds and annually appropriates operating funds to the Routt County Fair Association. The Fair Association is responsible for the fair production as well as use and maintenance of the facilities. The Routt County Fair has been held on the same 37-acre tract where it was launched in 1914. Stories made and told sitting I the stands and leaning on the fence railing reflect the heritage of the Yampa Valley's ranching, mining and recreation communities. The first Fair was held September 9-11 in 1914, a year after the railroad opened the Yampa Valley to trade and tourism and the same year Howelsen Hill Ski Area and Perry-Mansfield Performing Arts School and Camp were created. The 1994 Fair & Rodeo was hailed as the Best New Western Slope Rodeo by the Colorado Professional Rodeo Association. A Pictorial Archive of the Routt County Fair 1914-1995 by Sureva Towler and Jim Stanko. You will find many of the stories found in Fun Fair Facts, Stories and Poems and you may just discover some interesting story about your grandmother that you never knew! This hilarious and historical book is soaked with Yampa Valley heritage and its unique characters. This must-have book is available for $8.00 per copy, plus a $2.00 shipping and handling charge. 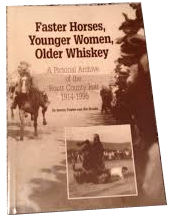 To request a copy of this great book, contact the Routt County Fair Office by phone 970-276-3068, fax 970-276-1023, or email. Own a piece of Routt County Fair History! Click here to purchase this photo frame, constructed from the 1914 track railing surrounding the historic race track. Since the grandstands were built in 1916 the Fair Board has hosted champion riders and legendary bucking stock. Since 4-H clubs were organized in the 1920s and a junior livestock sale launched in 1959, clubs are generating in excess of $100,000, used to purchase livestock or fund college tuition. Since exhibits were added in 1929, the Routt County Fair has encouraged education and excellence in youth, production standards for cattlemen and woolgrowers and civic pride in visitors. Because the Routt County Fair Association works in such close partnership it is sometimes confused with the Colorado State University Cooperative Extension service in Routt County. Whereas the Routt County Fair Association is primarily involved with producing the annual fair and making management decisions regarding the fairgrounds, the CSU Cooperative Extension office provides information and education to individuals, youth, families, agriculture enterprises and communities.